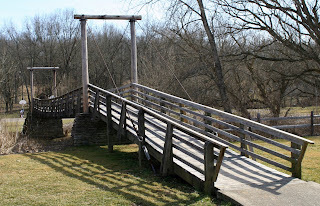 Big Bone Lick State Park is located in Northern Kentucky, 22 miles southwest of Covington on Kentucky Highway 338. At this site, in 1739, pioneers discovered fossilized remains of giant mastodons, woolly mammoths, and giant sloths. Some of these fossilized remains are on display at the park's museum. The unusual name for the park is a reference to these giant bones located at a place where animals gather to consume salt (called a "salt lick"). The suspension bridge pictured below is located in the park's play ground area. Big Bone Lick is also the home of a small heard of Bison. 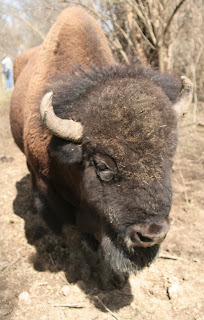 The American buffalo is the biggest of all North American land mammals. Great herds of bison once roamed this part of Kentucky and provided food, clothing and shelter for Native Americans and early pioneers. 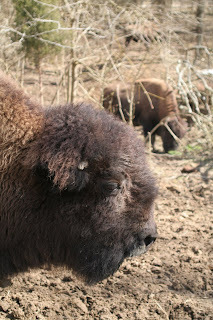 Bison were hunted to near extinction and the last wild buffalo was seen in Kentucky around 1800. This park’s herd is an effort to reestablish these animals at Big Bone Lick. Click here for more information on Big Bone Lick State Park.